Rudy Hartmann brings another post in our series highlighting the best ideas from ministries of all shapes and sizes. This post features Jonathan Chapman of the BCM at East Tennessee State University. Get this in your mind: You’re full of excitement and expectation of what God will do on a campus, believing that nothing is impossible for God, and that Jesus is going to crush the devil under his feet on your new campus. Then you come into eight students. And an old Baptist Collegiate Ministries facilities. And broken toilets. And confusing financials. It takes a certain type of person to start a new campus ministry, another to grow an existing campus ministry, and still another to revitalize a campus ministry. Jonathan Chapman of ETSU BCM is the latter. That was a year and a half ago. Eight Students. At the close of the spring semester of 2016, ETSU BCM saw 45-50 in their weekly large group, 5 small groups meeting weekly, several events with more than 65 students, one event with over 100, and this summer saw 20 students go on summer missions. 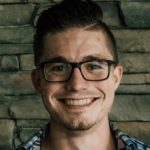 After talking with Jonathan for a while, I thought his “Best Idea Ever” might have been the church partnerships he’s made over the last 18 months. As I called him, he was just stepping out of a meeting with a local church pastor, planning how they could work together to reach the campus this fall. With 20-30 churches partnering with the BCM, the future is bright. However, Jonathan made it clear that while that was beneficial and worth celebrating, it couldn’t be a “Best Idea” focus, because, for Jonathan, that’s what BCM’s are supposed to do. When we started talking, I knew I liked this guy. Few people would say “Eight students? Facilities and financials in need of repair? Ministry revitalization? Sign me up!” Basically, JC is a stud. However, after he said this, it took my level of respect to a whole different level. This was such a fantastic picture of BCM and the Local Church working together to see the Gospel brought to a campus in need of it. As we dug deeper, Jonathan tipped his hand and explained exactly how this exact movement is happening. Lunch in the Cave is a weekly, brown-bagged lunch in the bottom-floor of the Student Center where the students of the BCM go to enjoy community amongst each other and then walk around and engage with those who are sitting by themselves. By focusing on the fringe, Jonathan is reaching who no one else is reaching, but going to the places no one else is going. Six guys — only two less than the total amount of students Jonathan started with 18 months ago — who wouldn’t have had any reason to come to the BCM and have the Gospel presented to them other than the fact that the students of ET BCM decided to focus on the fringe and reach those no one else was reaching. This fall semester, go after the athletes, go after the Greeks, go after the influencers, go after everyone you can — and don’t forget to focus on the fringe. You never know what God will do when you go where no one’s going. Do you do an event similar to Lunch in the Cave? Where is a place you could do an event similar to Lunch in the Cave on your campus? Do you have a simple conversation starter that could be used by your students and taught by students to other students? Ever considered Soularium? On your campus, who are the fringe groups you could focus on? What student-groups on your campus aren’t being reached? Which have your students been uniquely gifted to reach?